Mayo and Derry will be first into the fray in Sunday's Football League Division 1 semi-finals double-header at Croke Park. The opening last-four game will throw-in at 14:00 BST with the Cork v Dublin game then scheduled to start at 16:00. Mayo easily beat a second-string Derry side at Castlebar in Sunday's final series of round-robin Division 1 games. 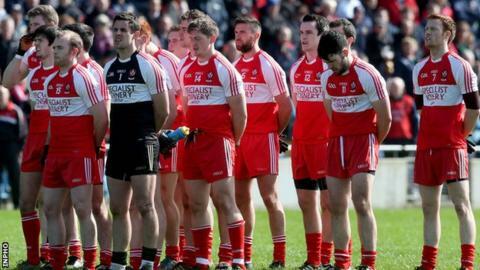 Derry had already qualified for the semi-finals and this weekend's team is likely to have a more familiar look. Armagh referee Padraig Hughes will take charge of Derry's tussle with Mayo while another Ulster whistler, Down man Ciaran Branagan, will officiate at the Cork v Dublin game. The winners of Sunday's game will meet in the Division 1 final at Croke Park on Sunday, 27 April [16:00 BST]. The Division 1 final will be part of a double-header that afternoon with the Divison 2 decider between Donegal and Monaghan taking place earlier [14:00]. The previous evening will see the Division 3 and 4 finals taking place at headquarters. Tipperary face Clare in the Division 4 final at 17:00 with Cavan's Division 3 decider following at 19:00. Meanwhile, the winners of Wednesday's Ulster Under-21 Football Final will be involved in the All-Ireland Semi-Final against Dublin on Saturday, 19 April. If Donegal win Wednesday's match, they will play the Dubs at Breffni Park while a Cavan victory will see the Breffni boys taking on the Leinster champions at either Tullamore or Portlaoise. A Cavan v Dublin tussle would be part of a double-header with the other semi-final also taking place at the Offaly or Laois venues.